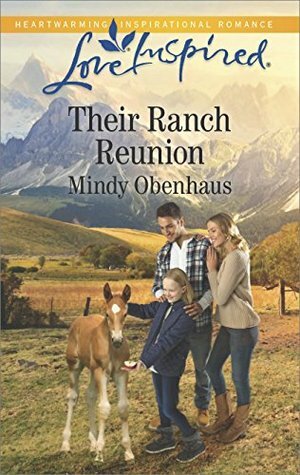 Their Ranch Reunion is the first book in the Rocky Mountain Heroes series and is the first book that I have read by Mindy Obenhaus. It will definitely not be the last. I enjoyed visiting the town of Ouray, Colorado and meeting the Stephens family. Carly Wagner grew up there, was married, took over the family B&B, had a child, was widowed and is now trying to save her business by expanding. When her beloved neighbour died, she left her home to Carly and her grandson Andrew. They each want to buy the other out, but with a fire, a sick father and a terrible storm, things get in the way of either of them doing anything with the house, but all these things put them together far too often to ignore the feelings they used to have for one another. This was a wonderful second chance love story. Carly and Andrew were wonderful, likable characters and Carly’s daughter, Megan, was a very sweet and loving child. I enjoyed watching as Carly and Andrew grew close to each other once more, many years after their first relationship fell apart. Carly struggled to trust Andrew and believe that his love could be real. Her first marriage was having difficulties when her husband was killed and she did not want to end up in an unhappy situation again. Andrew, on the other hand, was bogged down with guilt and even some anger over hardships from his youth, but could he overcome these feelings? I loved watching the two of them take chances to see if they could make a go of their relationship. It wasn’t smooth sailing, but what romance is? This was a heartwarming story that I recommend to romance lovers and those who enjoy a second chance romance. I received a copy of this book from Just Read Tours. The rating, ideas and opinions shared are my own. About the Author: It took Mindy Obenhaus forty years to figure out what she wanted to do when she grew up. But once God called her to write, she never looked back. A three-time Carol Award finalist, Mindy is passionate about touching readers with Biblical truths in an entertaining, and sometimes adventurous, manner. She lives on a ranch in Texas with her husband, the youngest of her five children and two dogs. When she’s not writing, she enjoys cooking and spending time with her grandchildren. Great review, Carla. This sounds like a sweet, fun read, and I love the Ouray setting!